We recently added powerful new features to your Google Analytics account. With these seven new features you’ll be able to get quicker insights, create deeper customisations, do more advanced analysis and track more mobile marketing! It’s always nice when Google adds a splash of red to the page and makes something else into beta (although I do wish that they’d bring some things out of beta – we’ve had advanced segments for ages, I know you’re going to make it better, but now that everyone has it you can’t really call it beta any more). The intelligence at the moment is an alerting system that will fire off an alert when something interesting happens on the site based on your predefined options. Some of these options will be useful to the casual observer, others more so for the constant user, but essentially all it does is give you the option of sending yourself an email when something interesting happens. So for your average blogger who uses Google Analytics you could set your customised alerts up to tell you when you’ve got more than a certain number of visits (maybe what you’d normally get in a day) so that you can go and see if there is something up. Alternatively you could do the opposite and get it to alert you if you’ve got fewer than a certain number of visits in a day so that you can see if something is down. I suspect that you’d want to go for the first option, rather than the second one. The other thing the average blogger may want to do is set up alerts that tell him when a new referring domain comes in. As a blogger it is something that I look at because I want to know why people are linking to me – what are they saying, what is unusual, etc. If you don’t look at your Google Analytics for a couple of days then it’s entirely possible that it could be ages before you notice someone has linked to you from their blog and you’re suddenly at comment number 25 with your response on their blog rather than comment number 5. Outside the blogging world you could use it very well for two things. Firstly you’d want to keep an eye on your goal conversions in a similar way to above so that you could find out if there was suddenly an uplift in orders (sometimes you might not find this out until too late if you wait until the end of the week or month for your reporting). Or a sudden decrease too. The other thing it will be useful for is your campaigns. Given you can set up how many visits your campaign is getting as an alert, you could get it to tell you very quickly when you stop getting visits. This will be important if you have ppc budget being spent and it suddenly runs out. You can then make the snap decision on whether to put more in or whether you wait until the next month. What excites me a bit more than the fact that you can now have lots of custom goals (you can have 20 of them) is that you can set them to be other things. 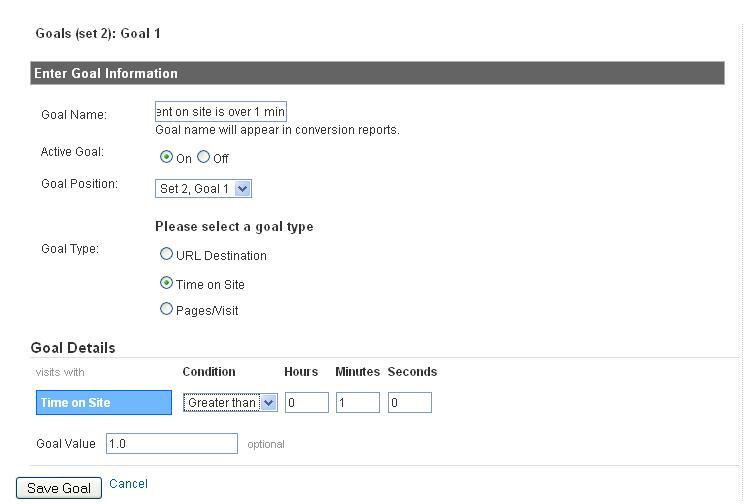 I’ve talked in the past about how to set up goals in Google Analytics (boy I’m starting to wish that I’d written to posts, one about HBX and one about GA). So in the past you would either have to set them up in your back end as a url (or group of urls), whereas now you can have some ‘Engagement Goals’. I like talking about engagement, but then I frequently worked on websites were there were no commercial values at the end of it, so for those types of websites, this is perfect (eg this one). Knowing which referring sources are keeping your traffic on the site for longer is great, but don’t forget that you really do want to start defining goals on your site. Usually you don’t really want people to just read more, you want them to perform some action on the site (download whitepaper, apply for jobs, etc) which you should be defining as your goals. 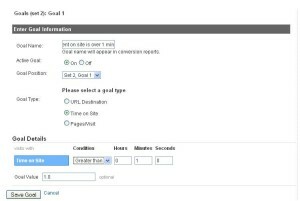 Fortunately you can now set up 20 goals in your Google Analytics account, in four individual steps. That’s great if you sell lots of different things. I suppose the one downside is that you still can’t state the value of the sale on the client side (you have to define it along with the goal name in the user interface). This will be a put off for many online shops that sell many things of different values. This is the one that I’m more excited about. There is a nice description of how to do it on the Google code site. Essentially it allows you create five custom variables that you can associate with a page, a visit or a visitor. This means that you have the equivalent of five things that you could track that you previously couldn’t. For example, you website has a load of pages that sit in one part of the IA, but you don’t happen to include that in the url, then without custom variables, you can’t tell how many people have visited it. So you could set up your first custom variable to be a page based custom variable for the different sections of your site allowing you to easily disseminate the parts of the site that the user has visited. This can be true of anything that you can set on the page that you can’t set in the url (eg if there are lots of you writing content, you could put the authors name as one of them). For your visit based custom variables you’d probably want to use them in a slightly different way. These will be things that you’ll want to know that a user has done in their journey and probably continued to do for a while. Eg the state of logging in to a site. You can then associate everything that the person has done on the site knowing that they were a logged in user (even if they weren’t logged in when they did it). For your visitor level metrics you will want include things that will allow you to track across many visits. Eg if you collect data about a visitor at some point (like they are male, they are 20 or that they have signed up for a quote but haven’t bought anything yet) then you should use your visitor metric to allow you to look at these values. This then feeds very nicely into the last of the features I’m going to talk about here which is the Unique Visitor Metric. This is a metric that existed before, but only now can you actually start creating custom reports and segments with it. Now that you’ve got some bespoke custom variables, it would be very nice if you could segment by those people and this is one of the nice features.